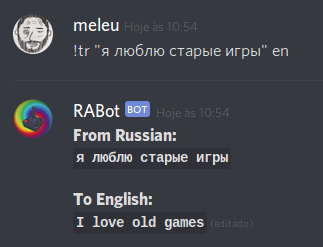 RABot is the the official RetroAchievements Discord robot. 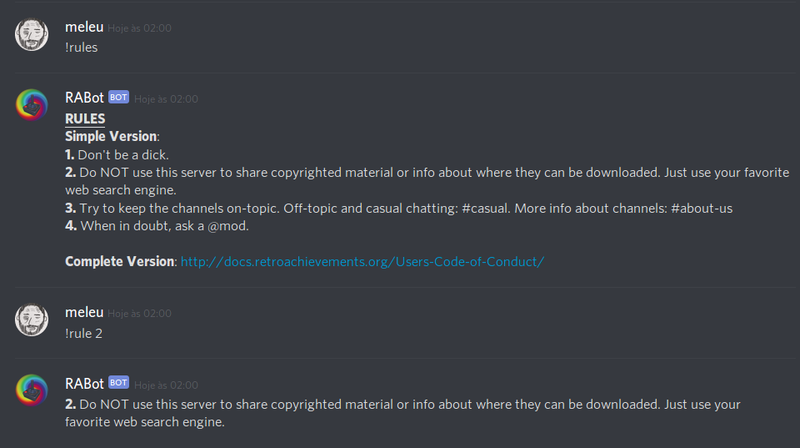 Therefore, to interact with him, you need to be a member of the RA Discord server. 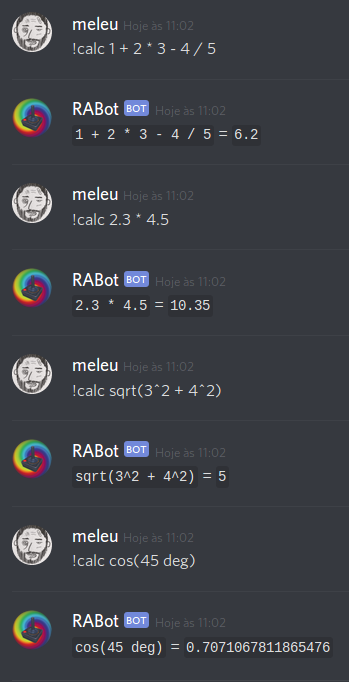 RABot has many cool and useful commands and in this page you'll see some examples of how some of them can be used. 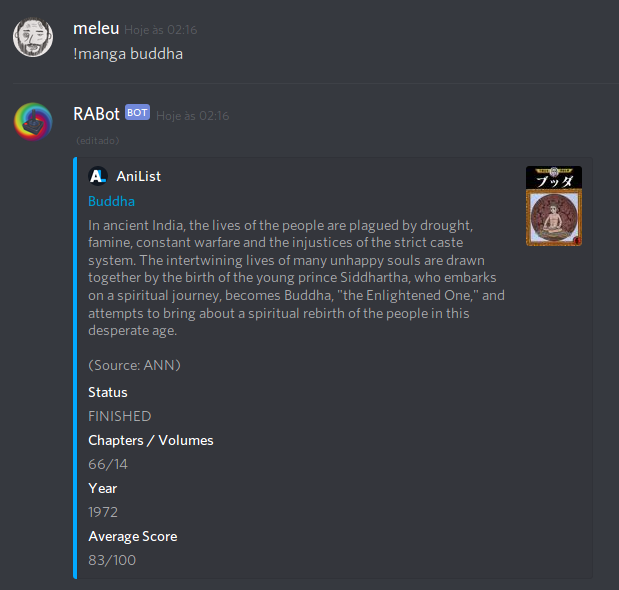 Special thanks: the DragonFire's Xiao bot is a great source of inspiration for many of the cool commands we have in RABot, like !akinator, !bulbapedia, !manga, !translate, !define and others. 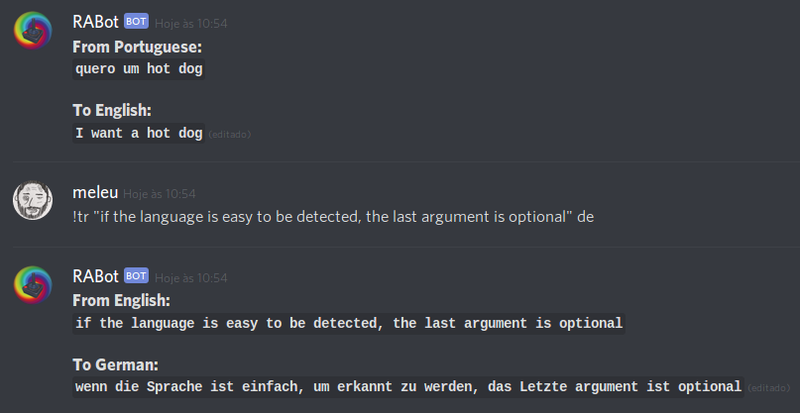 This command makes the RABot send a DM with the list of commands available. If you need help about a specific command use !help command_name. 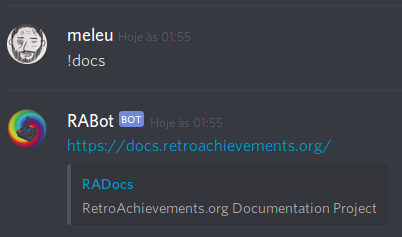 Provide links to RetroAchievements documentation. 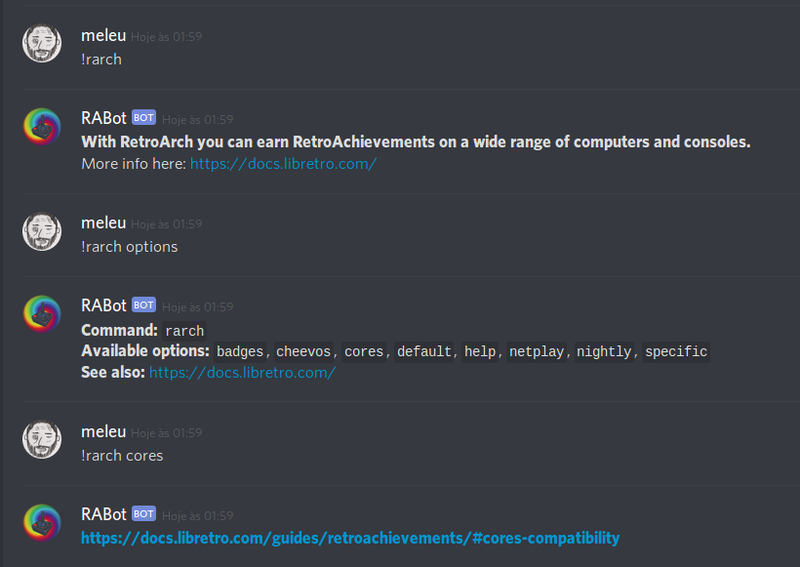 Provide basic info about RetroArch. Show the rules, or a specific one. Show info about the RABot. What to do when the site is down. 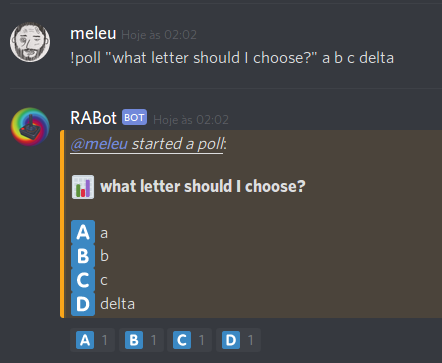 Creates a simple poll. People can vote adding reactions, but they can also vote with unlisted reactions. See !tpoll if you are interested in a more advanced and serious poll. Creates a timed poll. 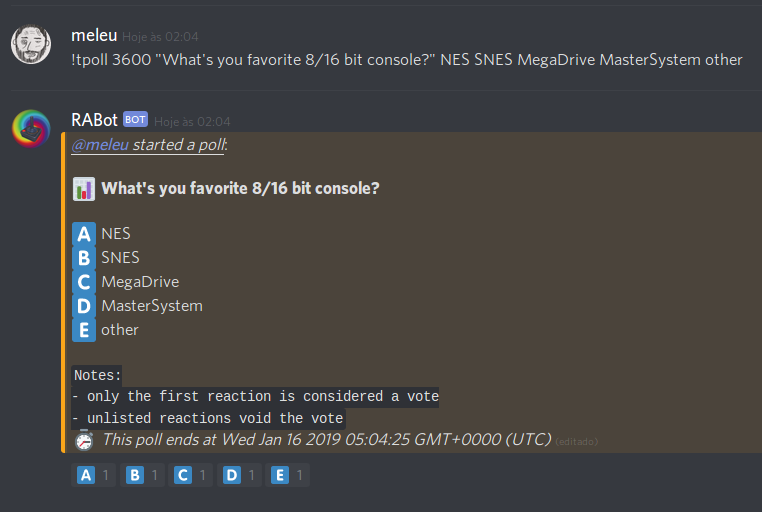 In this kind of poll only the first reaction is considered a vote, and if people react with an unlisted reaction then the vote is voided. 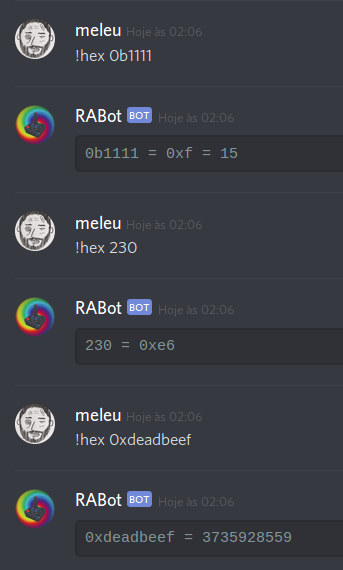 Converts a non-negative integer from decimal (or binary) to hexadecimal (or vice-versa). 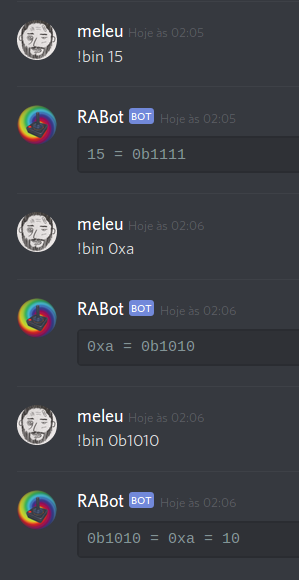 Converts a non-negative integer from decimal (or hexadecimal) to binary (or vice-versa). Evaluates the given math expression and responds with the result. 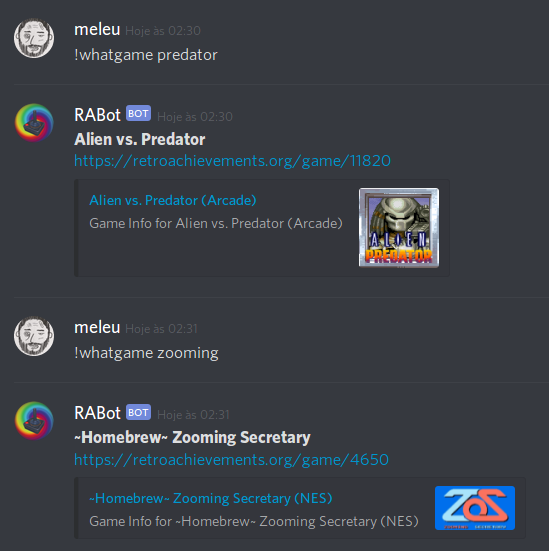 Google for a game at RetroAchievements.org and show the link. Return the URL for the open tickets page of the given game name. Responds with a random game that has achievements. 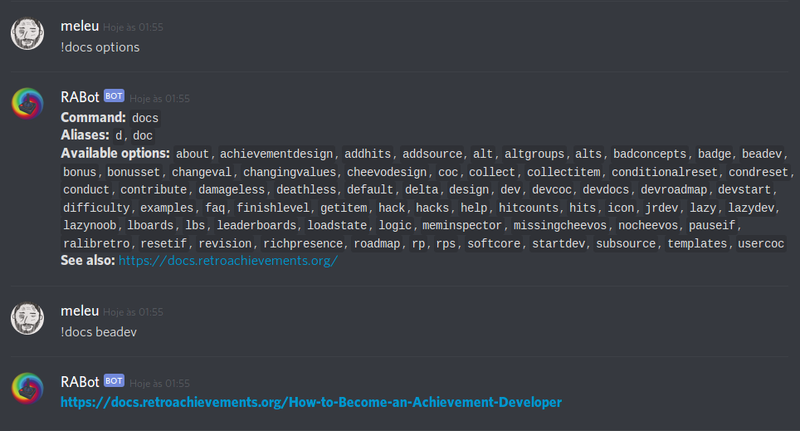 Responds with a random achievement. 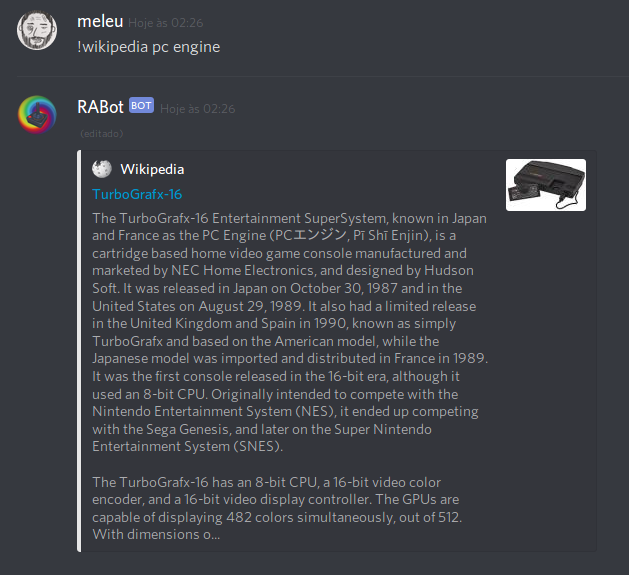 Responds with a retrogaming fun fact. Note: you can suggest more fun fact entries here. 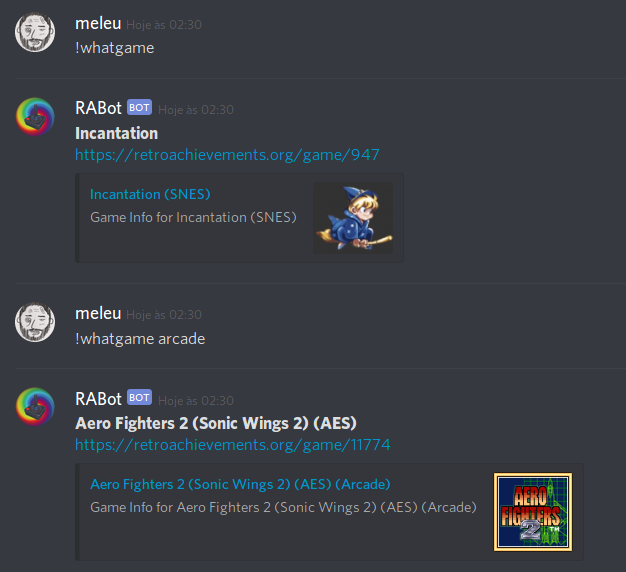 Responds with a RetroAchievements meme fact. Note: you can suggest more meme fact entries here, but keep these 2 simple rules in mind 1) you can't suggest your own quote; and 2) when suggesting a quote, be sure to get an approval from the author and/or the person being mentioned. 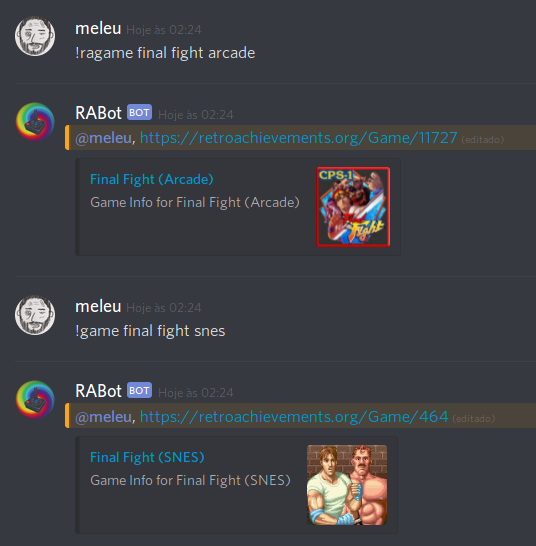 Google for a game at GameFAQs and show the link. 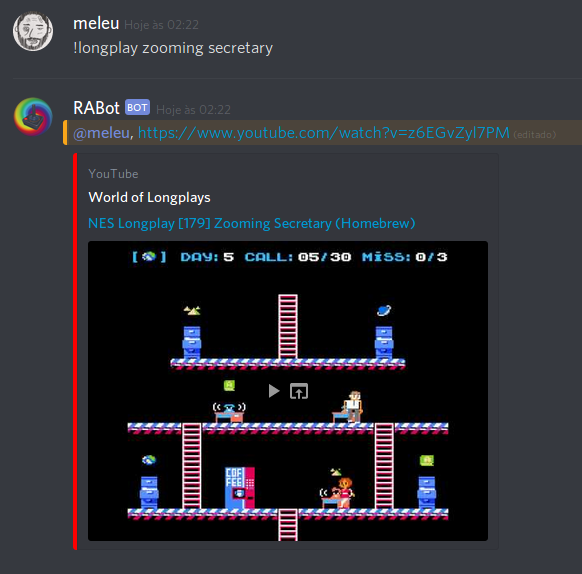 Search for a longplay video on youtube and post the link. 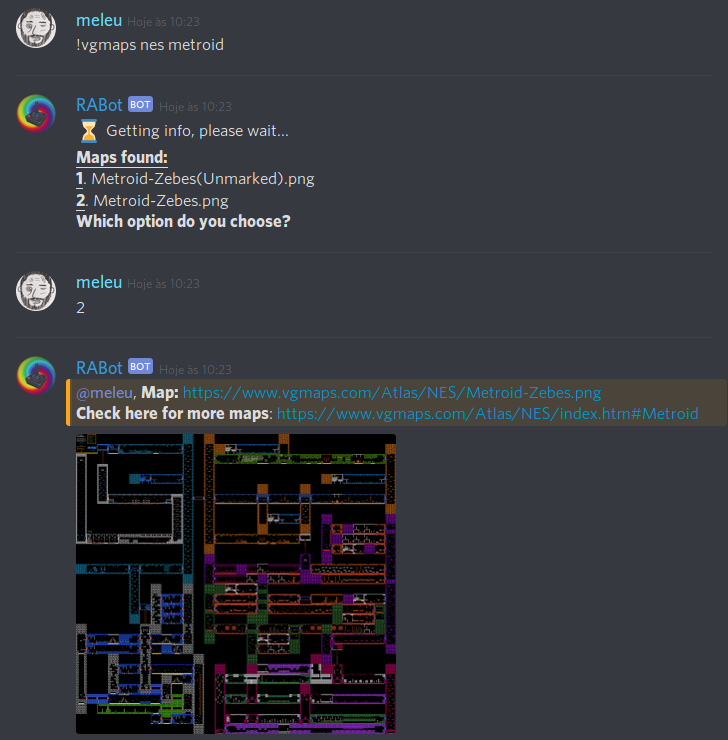 Searches vgmaps.com for a video game's map. 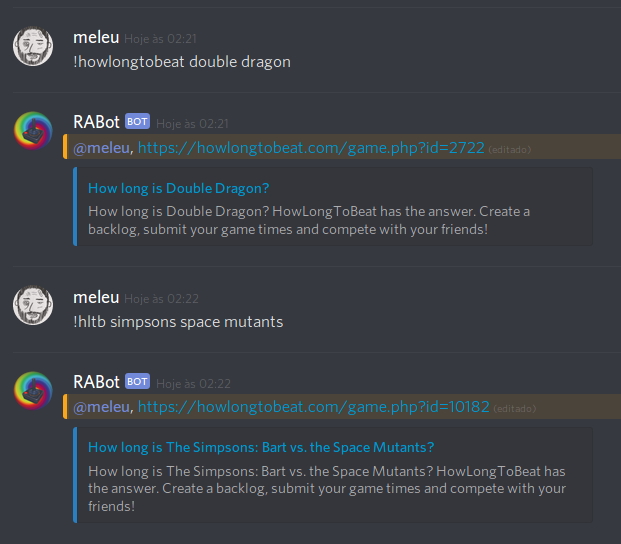 Google for a game at howlongtobeat.com and show the link. 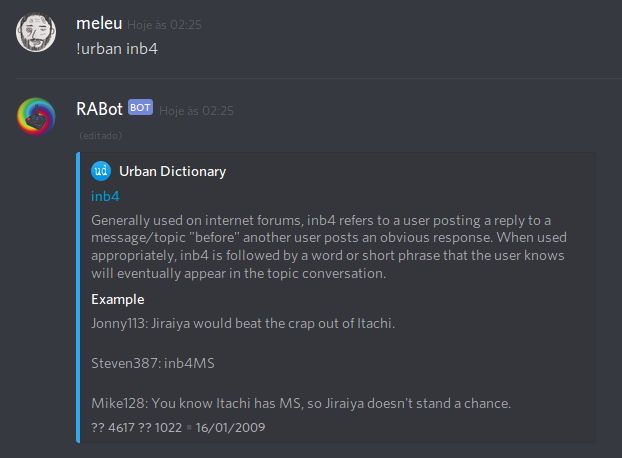 Defines a word, but with Urban Dictionary. Searches Wikipedia for your query. 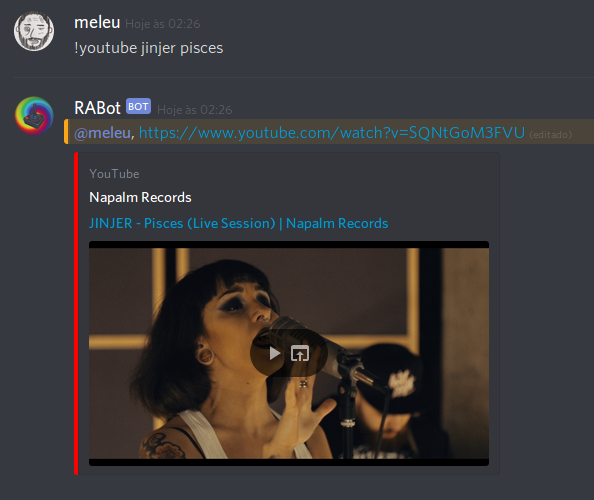 Search for a video on youtube and post the first one found. 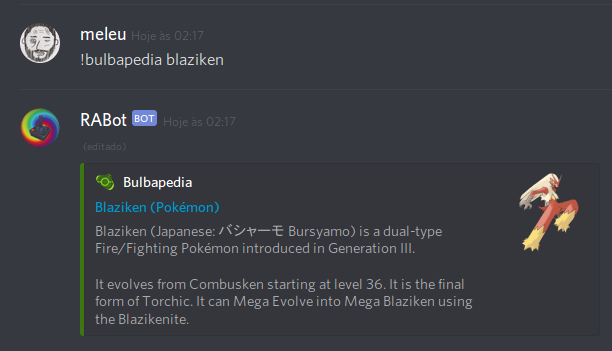 Searches Bulbapedia for your query. 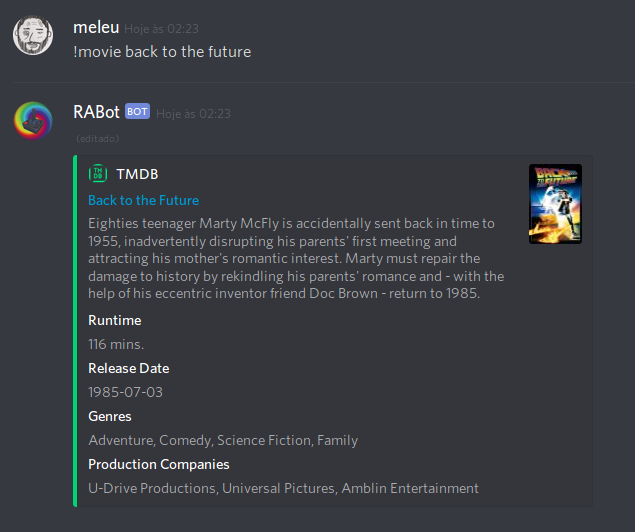 Searches TMDB for your query, getting movie results. Searches AniList for your query, getting manga results. 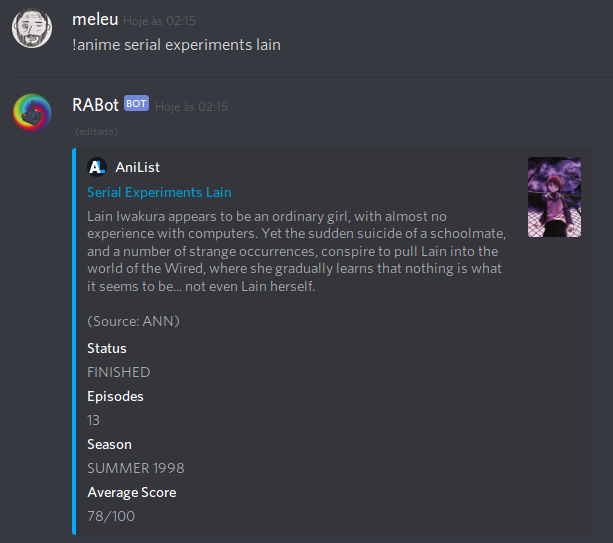 Searches AniList for your query, getting anime results. 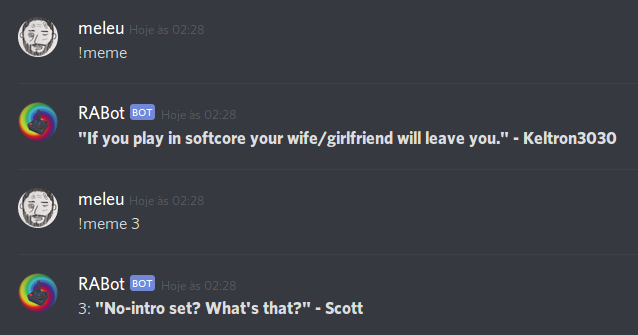 You think about a real or fictional character, the bot will try to guess who it is.